An ancient woodland in the steep valley of Char Beck, the woodland comes alive each spring with birdsong and a beautiful show of woodland wildflowers. 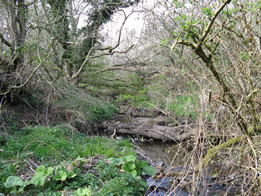 The Howls is a woodland nature reserve situated near the village of Dalton Piercy following the valley of Char Beck. The wood is dominated by an ash and sycamore canopy with hawthorn and elder and in parts gooseberry. Each year the woodland provides a colourful display of spring flowers including early purple orchids, violets, bugle and scarlet pimpernel. The locally uncommon twayblade grows here. The Char Beck gives the reserve an added dimension and plants that like the damper conditions and soils thrive, including marsh marigolds, meadowsweet and a variety of ferns including broad buckler, hard shield and male fern. Fifty-three bird species have been recorded on the site and the summer is a good time to see many of the summer warblers and the occasional spotted Flycatcher. At one time this deep wooded valley was going to be flooded to provide a reservoir, but fortunately plans were changed and its ancient woodland and wildlife have survived. It is owned by Hartlepool Water Company and has been managed by the Tees Valley Wildlife Trust since 1991. Having driven through Dalton Piercy village from the A19 take the first turning on the left after crossing the river. This is the access track for the reservoir; park on the hard standing next to the gates and follow the path into the reserve. The reserve paths can be muddy after rain and care should be taken when using the flight of steps near the entrance.